I thought it fitting to wrap up the last day of 2014 with a year-end update. 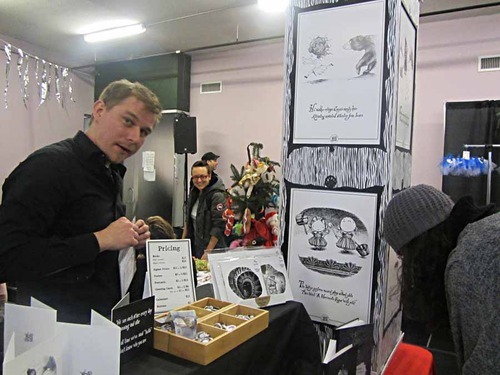 I recently took part in the winter edition of Bazaar of the Bizarre. Another great show organized by Adriana at Plastik Wrap. Louise Peacock took tons of photos and posted them on her blog Fashion Business Fun. Take a look. I’m sure this will entice anyone who missed it to come next time, especially if you’re often stumped for gift ideas. I picked up a bunch of Christmas gifts from my favourite maker of handmade body care products, Peculiar Potions. Quality products made from ingredients that are not cruelly tested on animals. It was a pleasure chatting with Peculiar Potions’ Becka. It was easy to do since she was positioned directly across from my table! At the Bazaar, I signed a book for “The Addams Family”. I kid you not. The lovely woman I was signing the book for explained that she and her husband will be legally changing their family surname to Addams since neither felt comfortable acquiring the other’s last name and Addams suited their personalities. What a fantastic idea! These ornaments are now part of the Soelberg Christmas tradition. Thank you Marla! 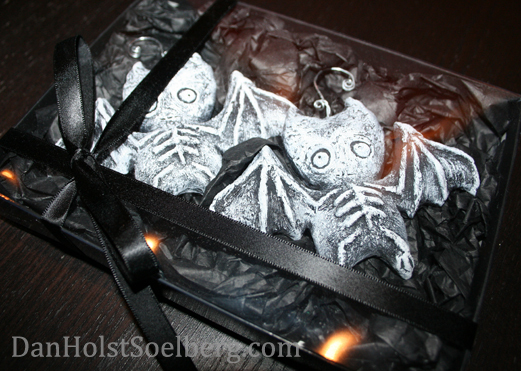 A little while later, the soon to be Mrs. Addams gave me a gift “from the Addams family to the Soelberg family.” They are beautiful ornaments. It turns out the nearly Mrs. Addams is also known as Marla from Gloom Matter, and she was selling her wares at the Bazaar too. Thank you Marla. Before I say goodbye to 2014, I want to share a lovely note I received from a fan. I made a couple of new prints this winter, both requested by fans. So, as of now, my shop has brand new prints of Tilda and Shaw. I promised not to make Tilda available before Christmas because it was a secret gift. The print of Shaw was requested by Jenn, who was decked out in a fantastic Mars Attacks! costume at the recent Hamilton Comic Con. I found payment from Jenn yesterday in my rusty old mailbox with a nice note written on the envelope. Thank you Jenn. Your words mean a lot. 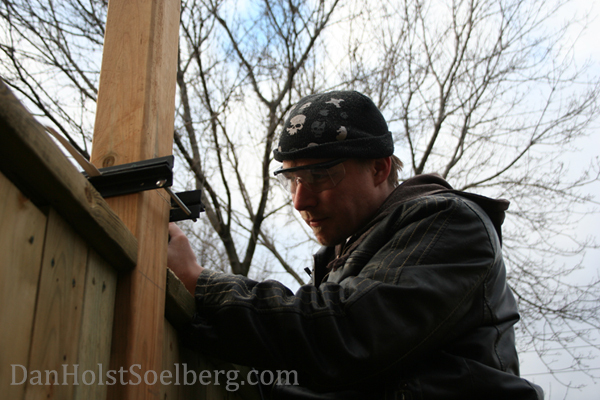 Here I am trying to stay warm as I trim down fence posts with a reciprocating saw. I love tools! So, I’ll be spending the rest of my time off putting the finishing touches on my fence (yes, that’s still happening!) and doing lots of nothing with my family. Here’s to another year! 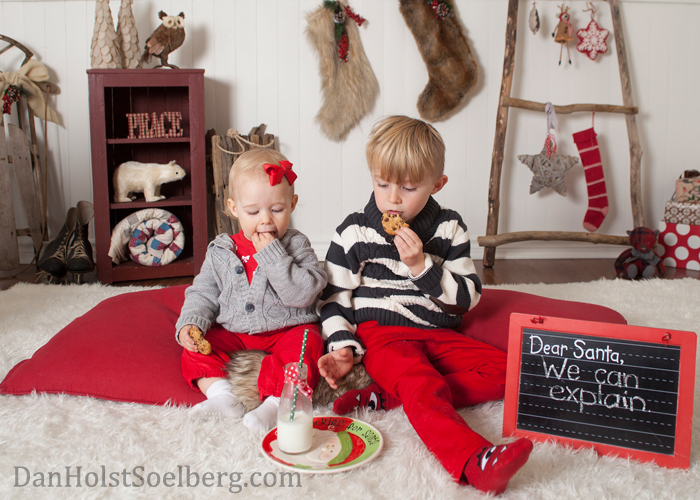 When the photographer’s direction is to eat cookies, Shaw and Grey are natural models! Would you pick a dime off the street? Last week I mentioned meeting with an editor who works for a big Toronto publisher. The editor talked about a particular book and asked me if I would consider creating the cover artwork and maybe some other graphics. I was flattered and intrigued. I also knew that I would have to put my current creative project on ice and make myself unavailable for a period of time. 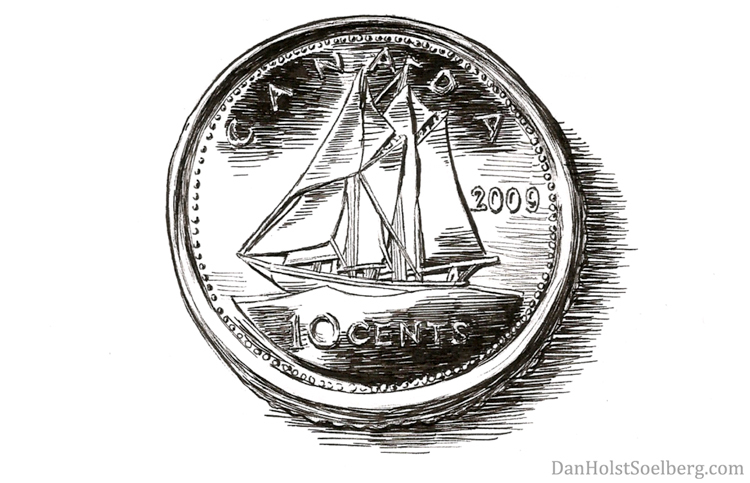 I was walking along, considering all this when I found a dime on the street. Finding money has always felt like receiving a little gift. I think about all the people who saw the same coin and decided to pass it by. I wonder what they thought in that instant. I wish I could be in their thoughts when they made that split-second decision to ignore it. Think about all the times you have done the exact same thing. Maybe you were deep in thought and the coin on the ground barely registered. Maybe you were distracted by something else. Maybe you self-consciously imagined that others would judge you for picking it up. More than likely, you saw it, thought about stopping to pick it up, had a clear picture in your head of doing it and decided it just wasn’t worth the effort. Found money is a symbol of opportunity for me. When you gain money, you have more potential and more liberties. Even a small amount of money can make a difference. Just ten cents added to you wallet could mean that you get the large coffee instead of a medium. Or maybe you give it to someone in front of you in the check-out line who needs just ten cents more to cover this week’s groceries. A coin found on the ground is a reminder that opportunities come at me all the time, and I can receive them if I just make a little effort. Many years back, I decided to collect found money in a glass jar to remind me of all the opportunities that I say yes to. Since then, whenever I find money, I am reminded that a positive opportunity is a choice that I make. I can act on it or I can ignore it and let the opportunity pass me by. I can say yes to opportunity or I can find a reason to say no. I can pick up the coin or I can walk away from it. So, when I found the dime after my meeting with the editor, it was a reminder that I had been presented with an opportunity. The choice was mine. I could decide at that moment to say yes and commit to a new adventure filled with things that I couldn’t imagine. I haven’t added the dime to my jar yet. When I came home after that meeting and pulled the dime out of my lint-filled pocket I put it on my drawing table where it sits now. While I continue to work on the project that I said yes to, the dime is there to remind me that I am opening possibilities for myself. I am creating opportunities by saying yes. This week’s plug: I’m at Bazaar of the Bizarre on December 14th, 11am-8pm at 6 Noble St, Toronto. Everything that I sell on my online shop will be available, and I’m happy to sign and dedicate anything you buy on the spot. And of course, I’ll have my Christmas greeting cards for sale as well.